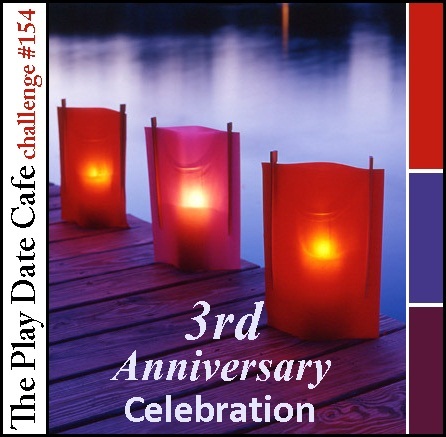 Today I am an Alumni Guest over at The Play Date Cafe Color Challenge, my very first design team. :-) Julie Ranae of the PDCC invited all of her past team designers to join for this very special 3rd Anniversary BIG bash. 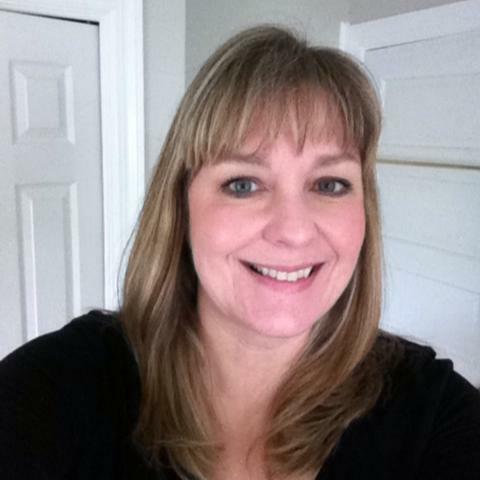 Thank you, Julie, for this wonderful opportunity and Happy Anniversary! They encourage you as a player to 'interpret the colors' as YOU see them. They welcome pretty much ANY type of project from cards to layouts, knit, crochet & sewing, mixed-media and even cupcakes (yum). So bold! I am scared of brights, and tend to add lots of white to balance them out. These Persian Motif dies are new to me (and there's a Fleur de Lis Motif layer here, too). I LOVE them. They look so cool stacked up on each other, topped by a glittered chipboard heart. The sentiment is Verve, and the tag die is Memory Box. 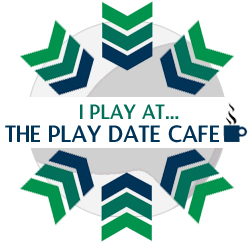 You've still got time to play at The Play Date Cafe. There are prizes from a variety of sponsors and additional giveaways for becoming a follower of the challenge and for displaying their brand new badges. If you play, tell them I sent you! Colleen, this is over the top stunning! Love it, and it is so nice to have you at The Play Date Cafe this week! So beautiful Colleen! Happy Anniversary too! WOWZA....way to rock the colors...this is fantabulous!!! Beautifully done with the dies and glittery heart. I love all the white space. Sometimes, I think I could go completely CAS. No, I would miss all the embellies and pretty papers too much. Ohhhhhhhhhh this is just gorgeous!!! I loveeeeeeeeee the added pearls!!!! Love all of the white space with your pretty pretty pop of color Colleen! Happy to see you back at the Cafe! Wow, those colours on white certainly pop, amazingly pretty! HA! LOVE IT! I think I have this die and have never used it! [Thanks for the inspiration.] 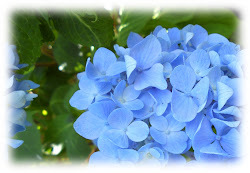 I love the bright bold colors against the white - GORGEOUS! Beautiful, Colleen...what a great mix of the colors and on those pretty die cuts, too! Marvelous! Another beauty! Those colors are so pretty together. I really love the Persian Motif dies! So elegant - love it! Oh!!! i love the colors on this and your layering is simply Awesome...what a stunner!! LOVE how you used these dies with the bright colors!! Awesome card Colleen!